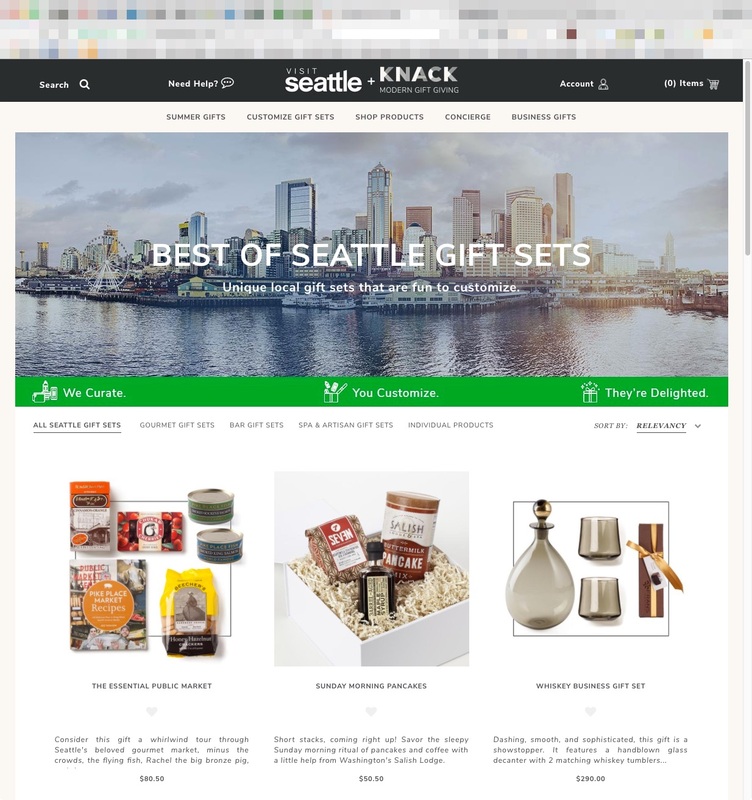 SEATTLE – Visit Seattle has selected Knack Shops, the premier online destination for Seattle gifts, as its exclusive e-commerce gift partner. Through a proprietary online platform driven by Knack and embedded into visitseattle.org, visitors and meeting planners are now able to create, purchase and ship Seattle gift boxes that are as unique as their own experiences in the Emerald City. While other Destination Marketing Organization (DMO) websites offer e-commerce functions, Visit Seattle is the only DMO armed with the technology to fully customize gift boxes with Seattle-specific products. From products by recognized Seattle brands such as Tom Douglas, Filson and Salish Lodge, to goods from up-and-coming makers like DECICIO Artisan Glass in Seattle’s Ballard neighborhood, Visit Seattle is working closely with Knack to offer the best Seattle gifts all in one place. Products are arranged into themed gifts sets that tell a story in categories like Gourmet, Bar, Spa, and Artisan. Visitors can either purchase these completed gift sets or customize their own with many other Seattle items available on the site. Knack’s gift boxes can be delivered to any downtown Seattle hotel or sent directly home, making it unnecessary to check baggage or overstuff a carry-on. Each gift box comes with a special Knackbook that includes a personal message and tells the story of each item in the gift. Visit Seattle’s Knack storefront is shared with visitors on relevant shopping pages throughout visitseattle.org and can be accessed directly at visitseattle.org/gifts. Visit Seattle is also offering a separate storefront for meeting planners at visitseattle.org/meeting-planner-gifts, which includes complimentary concierge service to help users navigate the site and create the perfect Seattle gift for their meeting or convention.